When setting up a single-player game you can adjust several game options. Once selected, these options will be in place for the duration of the game. You cannot change them partway through a game. Instead you would need to quit the current game a start a new one with different options selected. Game Options are described below. Robot Opponents: Choose the number of computer generated players who will compete against you to get the highest overall sustainability score. Range is 0-5. # of Fields: Choose how many fields each player's farm will have. Each field is modeled as being 40 acres. You can choose between 2-6 fields per farm. Variable Initial Soil Health: The game default setting is for all fields on all player's farms to start with the exact same fertility (i.e. 1400 kg of N/acre). 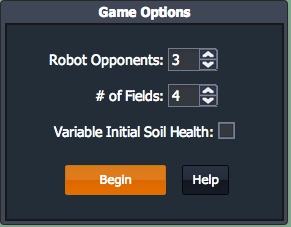 If you check this box, each field on a players farm will start with different initial soil fertility. Some fields will have higher fertility, others lower. But the average fertility for a farm will be the same for all players so as to make the game fair. Checking this box will add a layer of complexity to the game. Players will need to adjust their planting and management decisions for each field so as to achieve the most sustainable outcome.